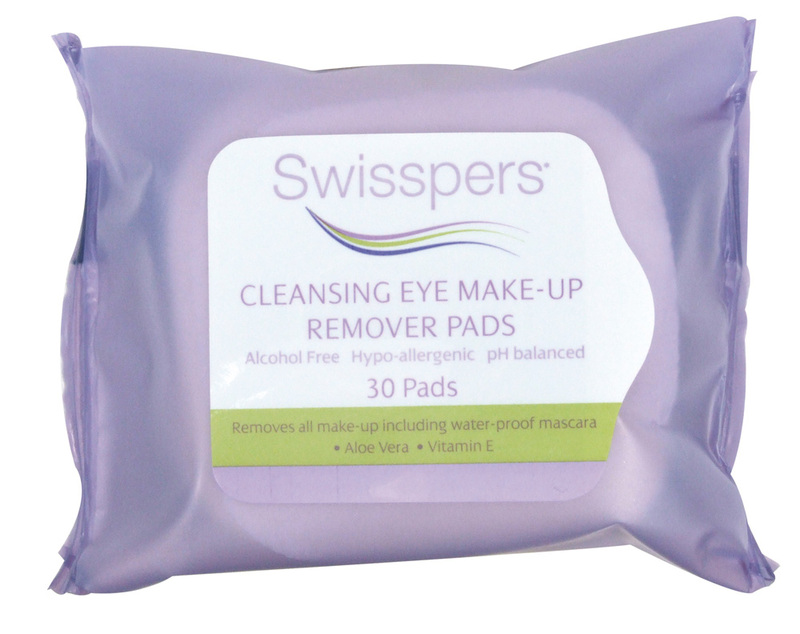 Swisspers Cleansing Makeup Remover Pads for Eyes are makeup remover pads specially formulated to conveniently and effectively remove stubborn eye makeup such as waterproof mascara, without rubbing. Each wipe contains aloe vera and vitamin E and is alcohol-free, hypoallergenic and pH balanced. I love these eye makeup remover pads. They are the perfect two in one! I was always buying swisspers cotton rounds and then adding eye makeup remove on them and now I don't have to. These are so quick and easy to use and inexpensive. They remove makeup well and are a great price. They are always fantastic to throw in your bag when you are on the run and don't want panda eyes after sweating it out at the gym! I thought these would be perfect for travelling, because I ordinarily use a liquid and cotton pads to remove my eye makeup and that's not really convenient. Really great concept, but unfortunately they are horrible. The material is really rough and there isn't enough product on the pads so they are dry. I would never intentionally use something so harsh on or around my eyes. The packaging looses it's stick immediately after opening too, so that may have contributed to the dryness of the product. Fortunately what little of the product I could use did not irritate my normally sensitive eyes (aside from the pad scratching up my lid). I would love to see Swisspers recreate these in a better way. I brought these pads with the hope that something would finally remove my eye makeup without making my eyes watery and red. This product also comes in a bottle that can be poured onto your own cotton pad. I have now tried both. I am not impressed. I have sensitive skin around the eye area and sensitive eyes, I thought this would be an amazing product, but it is not gentle at all!! My eye makeup doesn't budge with me having to rub my eye raw with these wipes and I don't even wear waterproof mascara! The packaging is cute and the price is not bad, but these really are not worth the money! Nor is the bottle version, both gave my skin the same reaction. It was my first time to try on this kind of item. I normally using normal eyes and lips remover with cotton pads but those seems to be too difficult for traveling so i decided to pick this one since it is inexpensive and easy to put in my carry-on. However i felt disappointed with the quality. The package look nice in size and so convenience but the pads are so dry and tough not as soft as normal cotton pads. I applied waterproof mascara and eyeliner so i expected that it will remove eye makeup as quick as the normal remover which i usually use but it took time so long and after waiting for a while, there was only just a few makeup was removed so i tried to use it carefully and gently wipe my lash and eyelid but still the same and also stung my skin. so finally i gave up and used a drop of cleansing oil which i usually using with whole face, massaged on my eyelid and lash and rinsed. My all eye makeup gone and my skin become cleaned after that. No tips for it, just throw it away! My usual makeup removal routine involves dampening the cotton pads with the makeup remover solution. But now The facial wipes makes it even more convenient, especially on lazy days or after a long night. I love how these wipes aren't too harsh for the face while I can easily wipe off makeup - even waterproof mascaras! This really makes life easier! I like this product. It's very handy and gets all my eye make up off. It feels a little rough against the skin though, would have been perfect if it was slightly softer, afterall this is for the eye area. I love those when I travel as I hate to carry liquid in my bag in a case of spillage. These make up removal pads are quite small but work well enough to remove make up. Not great for waterproof as they leave some make up behind. The scent was very heavy on these, and they actually stung my face. However, the stinging subsided, and they removed all the my makeup very well.. I love the lavender packaging, its small and can easily fit in your makeup bag or whatever you want to pop it in. The downside is that the tab that you use to open and close doesnt have enough "stickiness" for it to remain closed. After a few times with using the product it wouldnt close so the wipes pretty much dried out. I used it when I was trying to wipe bits of eye makeup but it more or less smudged my eyeliner on my face, it really didn't wipe it off. The texture of the wipe was quite rough it felt like my skin was being scratched. The wipe was moist but the paper should at least be a bit thicker. I have been using this for a while and even thought I have to wipe it a couple of times over my eye, it works for me. It doesnt dry or make my skin red, so I use it. It is a bit expensive, but I have used another eye removal wipe which was very irritating for my skin. This is the one I buy for eye make up removal. It goes on gently for me and even though I have to wipe it 2 or 3 times over my eye to remove the make up, I like it best compared to all others I have used. I find it gentle and non irritating to use. I dont wear a lot of eye make up, mostly just eyeliner, so its good for my use. If I wore a lot more eye make up, I definitely need to use 2 sheets to remove all my make up. First impression - great size so would be handy for travel. One thing that started irritating me straight away is that after opening the label, it wouldn't stick back on properly. The wipes are a decent size for removing eye make up, but I was surprised to find they were quite rough in texture. They are mildly scented of baby oil. The wipes were too 'dry' so I had difficulty removing eye make up - involved too much tugging for my liking! They did not remove much of my eye make up (NOT waterproof either) - I would have achieved similar results using a tissue and water. As I said earlier, the label is a pain as it loses stickiness so I actually have to keep the packet face down (as in label down) with something heavy on top to prevent it from drying out! Overall I am disappointed in this product and would not recommend it. The size is travel friendly, but that is the only positive I can come up with. I like these because they come in a small size that is fantastic for travel. I had them packed in my hospital bag when I had my youngest son. The first thing I noticed was the smell and it was quite pleasant. Then, when i felt the pad, it was rough, almost like sandpaper. When I tried to remove my eye make up, it hurt and didn't fully come off. This is not suitable for waterproof mascara and gel eyeliner! I actually really like these, they're cheap and easy to use, not overly greasy but don't leave you're eye area feeling dry or tight. Just a couple of swipes got rid of my eyeliner and any light eye shadow and mascara, so they're good to use on a daily basis. Bear in mind I don't wear a lot of eye makeup so I can't say how well they'd work against waterproof mascara. I bought these as I recently accidentally purchased a waterproof mascara which I don't normally wear. I actually really dislike this product, it most definitely does not remove all of my mascara and is horribly scratchy and rough around my eyes. It irritates my skin so badly that I am red around the eyes after use. I will never use these pads again. I bought these in my quest to find a great eye makeup remover and im really dissapointed. I find them to be too dry even when I store them upside down they still arent moist enough. They tend to smudge my eyeliner everywhere and i have to rub at my eye to get the makeup off and it doesn't remove mascara. Good for removing eyeshadow but not much else. i recieved these in a swisspers gift pack and i thought they would be good, but to my disappointment i discovered that these do not remove waterproof makeup. they worked well on foundation etc but the results for eye makeup were really bad. I use these pads when I'm too tired in the evening (and lazy) to remove my eyemake-up. It makes the task of removing eye makeup very easy! Not a bad product if your on the go and need to remove your mascara, I find this product a little dry and i need to go over my eye multiple times to remove one coat of mascara, also the price is a rip off as you dont get that many wipes and it doesnt last you long.